25 The mole rats of the East Coast were the creations of the United States Government, who were attempting to create an invasive species that would be introduced to China. 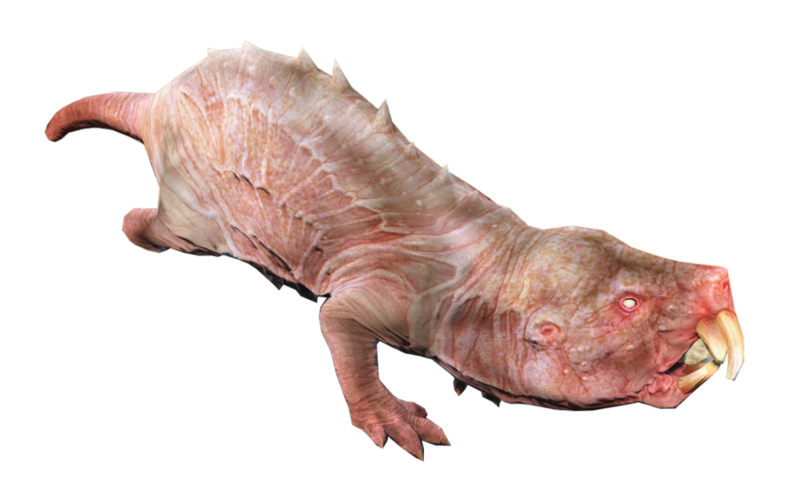 5 Mole rats are commonly encountered throughout the wasteland, wherever there is soil through which they can burrow. 10 Mole rats have poor eyesight over long distances, but rely on their exceptional sensitivity to tremors to pinpoint the location of prey. 15 Due to their ability to burrow at incredible speeds, mole rats are able to easily ambush their prey and escape back into the earth. 20 Two types of mole rats can be found in America: the furred mole rats of the West Coast are actually mutated moles, likely descended from Townsend's Mole (Scapanus townsendi), while the naked mole rats of the East actually are naked mole rats, or Heterocephalus glaber, though as those were not native to the United States it is unknown how they could have spread there. Speed 25 ft., burrow 25 ft.
Ambush Predator. If the mole rat hits with an attack after moving using its burrow speed, it can disengage as a bonus action. Bite. Melee weapon attack: +5 to hit, reach 5 ft., one target. Hit: 5 (1d4 + 3) piercing damage. Aggressive. As a bonus action, the rabid mole rat can move up to its speed toward a hostile creature that it can see. Bite. Melee weapon attack: +5 to hit, reach 5 ft., one target. Hit: 6 (1d6 + 3) piercing damage, and the target must make a DC 13 Constitution saving throw or be infected with rabies. Radioactive Glow. The glowing mole rat sheds bright light in a 10-foot radius and dim light for an additional 10 feet. Multiattack. The mole rat makes two attacks with its bite. Bite. Melee weapon attack: +6 to hit, reach 5 ft., one target. Hit: 6 (1d6 + 3) piercing damage and 7 (2d6) radiation damage. Advantage on Strength checks and Strength saving throws. Advantage on saving throws against becoming Frightened. +2 to the damage of all attacks. Resistance to bludgeoning, piercing, and slashing damage. If the brood mother takes damage after all mole rats have been killed, it makes a Constitution saving throw. The DC equals 10 or half the damage to the brood mother, whichever number is higher. On a failed save the brood mother loses the benefits of Maternal Instinct and uses its turns to attempt to flee, only attacking if it is cornered. Multiattack. The mole rat brood mother makes two attacks. Bite. Melee weapon attack: +9 to hit, reach 5 ft., one target. Hit: 8 (1d8 + 4) piercing damage. Giant Mole Rats were considered for inclusion in Fallout 3 but were ultimately cut. No information about what these creatures might have been like is available—the statblock and Knowledge here are purely speculative. Mind Your Head. If the giant mole rat uses its burrow speed while carrying one or more riders or objects, each such creature or object takes 7 (2d6) bludgeoning damage and is knocked prone in an unoccupied space adjacent to the giant mole rat. Multiattack. The mole rat makes one attack with its bite and two attacks with its claws. Bite. Melee weapon attack: +7 to hit, reach 5 ft., one target. Hit: 17 (3d8 + 4) piercing damage. Claws. Melee weapon attack: +7 to hit, reach 5 ft., one target. Hit: 11 (3d4 + 4) slashing damage. Speed 20 ft., burrow 10 ft. Keen Smell. The pig rat has advantage on Wisdom (Perception) checks that rely on smell. Multiattack. The pig rat makes two attacks. Bite. Melee weapon attack: +4 to hit, reach 5 ft., one target. Hit: 3 (1d4 + 1) piercing damage. Multiattack. The pig rat makes three attacks. Bite. Melee weapon attack: +6 to hit, reach 5 ft., one target. Hit: 4 (1d4 + 2) piercing damage. Bite. Melee weapon attack: +7 to hit, reach 5 ft., one target. Hit: 4 (1d4 + 2) piercing damage, plus 2 (1d4) poison damage and 2 (1d4) radiation damage. Keen Smell The mole rat has advantage on Wisdom (Perception) checks that rely on smell. Multiattack. The mole rat makes one attack with its bite and two with its claws. Bite. Melee weapon attack: +5 to hit, reach 5 ft., one target. Hit: 6 (1d8 + 2) piercing damage. Claws. Melee weapon attack: +5 to hit, reach 5 ft., one target. Hit: 4 (1d4 + 2) slashing damage. Multiattack. The mole rat makes one attack with its bite and three with its claws. Bite. Melee weapon attack: +7 to hit, reach 5 ft., one target. Hit: 8 (1d10 + 3) piercing damage. Claws. Melee weapon attack: +7 to hit, reach 5 ft., one target. Hit: 6 (1d6 + 3) slashing damage. Bite. Melee weapon attack: +7 to hit, reach 5 ft., one target. Hit: 7 (1d8 + 3) piercing damage, 3 (1d6) poison damage, and 3 (1d6) radiation damage. Claws. Melee weapon attack: +7 to hit, reach 5 ft., one target. Hit: 6 (1d6 + 3) slashing damage, 2 (1d4) poison damage, and 2 (1d4) radiation damage.